Credi was born in Florence, active as a painter and sculptor. He trained in the workshop of Andrea del Verrocchio (1435 – 1488), where he was known to have influenced a young Leonardo da Vinci (1452 – 1519), who also trained with Verrocchio. 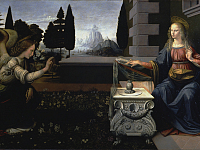 Though, as Leonardo gained prominence as a gifted artist, he would in turn become an influence on Credi. After Verrocchio’s death, Credi inherited the direction of the workshop, executing his Madonna di Piazza for the Pistoia Cathedral. 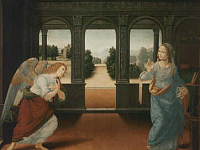 His other early works during this period include his Annunciation, now in the Uffizi Gallery and noted as one the artist’s most representative works. 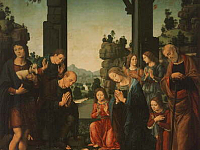 A later religious work by Credi is also in the Uffizi, his Adoration of the Shepherds, painted sometime before 1510 for the church of Santa Chiara. 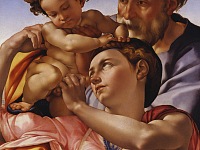 His other known works include a Madonna with Child in the Galleria Sabauda of Turin, Adoration of the Child in the Querini Stampalia of Venice, and Madonna and Saints from 1493 and now in the Louvre. 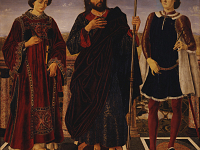 He also remade parts of Fra Angelico’s (1395 – 1455) panels in the altars of the Church of San Domenico in Fiesole. 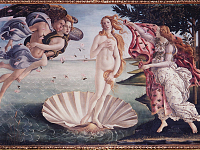 There is also is mythological piece, Venus, which was discovered in 1869 in a storeroom in the Medici Villa of Cafaggiolo and now in the Uffizi. Credi’s mature works, such as his Crucifixion now in the Gottingen Museum of Germany, the Annunciation from the museum of Cambridge and the Madonna and Saints from the Pistoia, all show an influence of Fra Bartolomeo (1472 – 1517), Perugino (1446 – 1524) and the early works of Raphael (1483 – 1520). Credi was a painter of portraits as well; exampled by additional works in the Uffizi, such as Portrait of a Young Man; a piece once thought to be by Filippino Lippi (1457 – 1504). Also in the Uffizi, his Portrait of a Woman painted around 1500, was once thought to be by Verrocchio or Perugino and was once attributed to Raphael. One of his portraits, La dama dei Gelsomini (or Portrait of Caterina Sforza) recently gained much attention when the face of Caterina Sforza was shown to have a striking resemblance to the face of Leonardo da Vinci’s famous Mona Lisa, which was painted between 1502 and 1506. Credi had a number of pupils, including Giovanni Antonio Sogliani (1492 – 1544) and Antonio sel Ceraiolo (active, 1520 – 1538).